Prior to becoming a park, the eastern edge of downtown Miami was of a jagged coastline consisting of docks, the FEC fair building and Elser Pier. Early Miami residents looked to Royal Palm Park for green space and an entertainment venue. 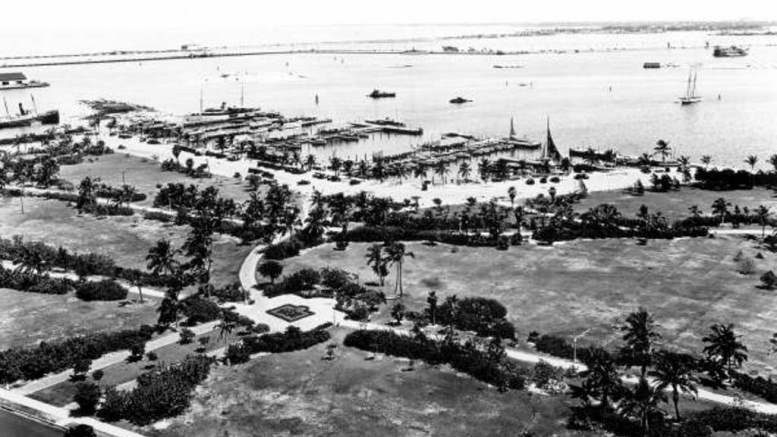 It was during the height of the building boom of the 1920s that Miami decided to extend the eastern edge of the city by dredging bay bottom to create Bayfront Park. Part One of this two-part series on the history of Bayfront Park will focus on the planning and creation of the park through the 1940s. The acquisition of property and creation of the park was completed by 1925. The creation of the land for the park was based on a practice used to create land in other parts of South Florida. Bayfront Park was a place of refuge during the depression decade. Miami residents sought assistance, entertainment and refuge at the park during this difficult time. Cesar Lamonica conducted free concerts at the bandshell in the park beginning in the late 1920s. During the war, the park was taken over by the navy. They built a recreation center for naval personnel in the park while they prepared for deployment overseas. In 1943, the City built and dedicated the War Memorial to honor those fallen soldiers from Dade County. Parades to promote the sale of bonds began terminated at the park each week during the war. The second part of this documentary series will focus on the park from 1950 to present day.